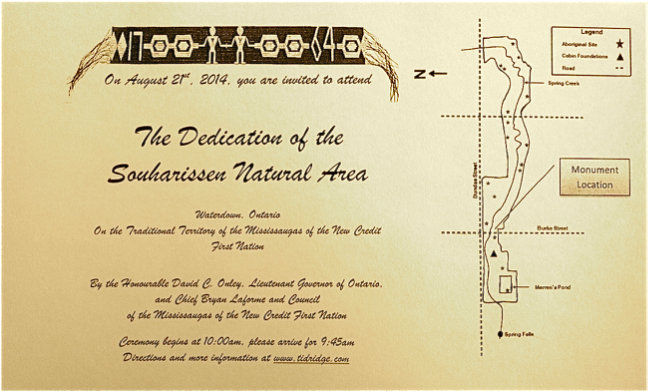 On August 21st, 2014, the Souharissen Natural Area was dedicated in Waterdown by the Honourable David C. Onley, 28th Lieutenant Governor of Ontario, and Chief Bryan Laforme and Council of the Mississaugas of the New Credit First Nation. Over 50 people attended the dedication including David Sweet MP, Councillor Judi Partridge, Carolyn King, United Empire Loyalists, and other members of the Mississaugas of the New Credit. The dedication ceremony began with a formal welcome by Elder Garry Sault, followed by dedication remarks by the Lieutenant Governor and Chief Laforme. At sunrise that morning, a Sacred Fire was lit by Elder Garry Sault in the Natural Area. Tended by a Firekeeper, the Sacred Fire was the first in Waterdown/Flamborough in generations (perhaps centuries) and was visited by both the Lieutenant Governor and Chief Laforme after the formal dedication ceremony. Since 1695, a vast region of Southern Ontario - including Flamborough - has been the traditional territory of the Mississaugas of the New Credit First Nation (who formally concluded a Treaty with the Crown - Treaty No.3 - on December 7th, 1792). This event will mark the formal return of the Mississaugas to Waterdown after over two centuries. The ceremony included Chief Bryan LaForme and Councillor Judi Partridge painting on the sidewalk an image (designed by Philip Cote) of an Ojibway moccasion. 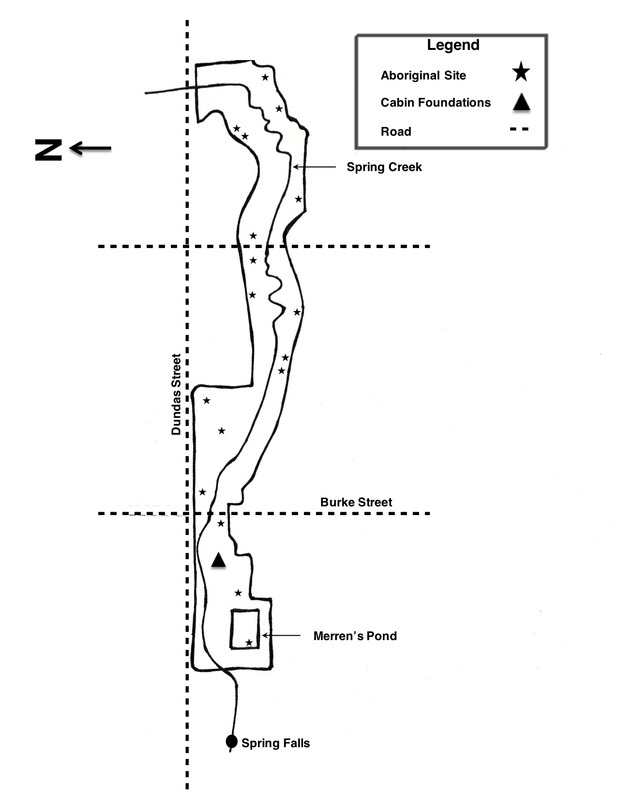 The Souharissen Natural Area covers 55 acres in the Village of Waterdown, and is the result of years of work following the discovery of 104 Aboriginal archeological sites in the Waterdown Bay Development Area in 2005. Councillor Judi Partridge has championed this project since its inception, providing unflagging support. Elder Garry Sault sings a welcoming song after presenting wampum evoking the Treaty of Niagara to Lieutenant Governor David C. Onley and Premier Kathlene Wynne on June 24th, 2014. In May 2014, a formal committee was established to create a Natural Area in the Waterdown Bay Development Area (across the street from Connon Nurseries) that would restore the Aboriginal identity and heritage to the region. The Committee's members are Holly McCann (Researcher and Cartographer), Kekoa Reinebold (Brown Cabin Researcher), Ishkwegiizhig (Eugene Kahgee of the Saugeen First Nation #29), Councillor Judi Partridge (Ward 15 Flamborough) and Nathan Tidridge (Chair). Elder Garry Sault of the Mississaugas of the New Credit First Nation consulted with the committee, providing invaluable teachings and support. On May 30th, 2014, a report was issued to the City of Hamilton, and from that a formal report to City Council was presented on July 9th. The Souharissen Natural Area Committee, with the support of Elder Garry Sault, presented their plan and history of the area to the Chief and Council of the Mississaugas of the New Credit First Nation on June 23rd, 2014, which was both endorsed and supported. The Waterdown-Flamborough region was home to the Chonnonton Nation (Called the "Neutral Nation" by the French and the "Attiuoindaron" by the surrounding Aboriginal Nations). The name Chonnonton means "the people who tend or manage deer," and they had a powerful leader with the hereditary name "Souharissen." Before the construction of the nearby survey, 104 Aboriginal sites were discovered revealing the lives of Chonnonton people ultimately destroyed by the Wendat-Haudenosaunee Wars of the mid-17th century. Peace was established between the Haudenosaunee (also called the Naadwe) and Anishinaabe Peoples with the exchange of the "Dish With One Spoon" wampum in the late 17th century. Around 1695 the Eagle was recognized as the leading dodem of the Mississauga/Anishinaabe People whose territory commenced "at Long Point on Lake Erie thence eastward along the shore of the Lake to the Niagara River. Then down the River to Lake Ontario, then northward along the shore of the Lake to the River Rouge east of Toronto then up that river to the dividing ridge between Lakes Ontario and Simcoe then along the dividing ridges to the head waters of the River Thames then southward to Long Point the place of the beginning" (Kahkewaquonaby, the Reverend Peter Jones, February 13, 1855). These lands, including the City of Hamilton, remain the traditional territory of the Mississaugas of the New Credit First Nation. Along with the Indigenous sites, the foundations of an early-19th century dwelling were uncovered in the area. This dwelling may have been used by the first European settlers of Waterdown, Alexander Brown and Merren Grierson. 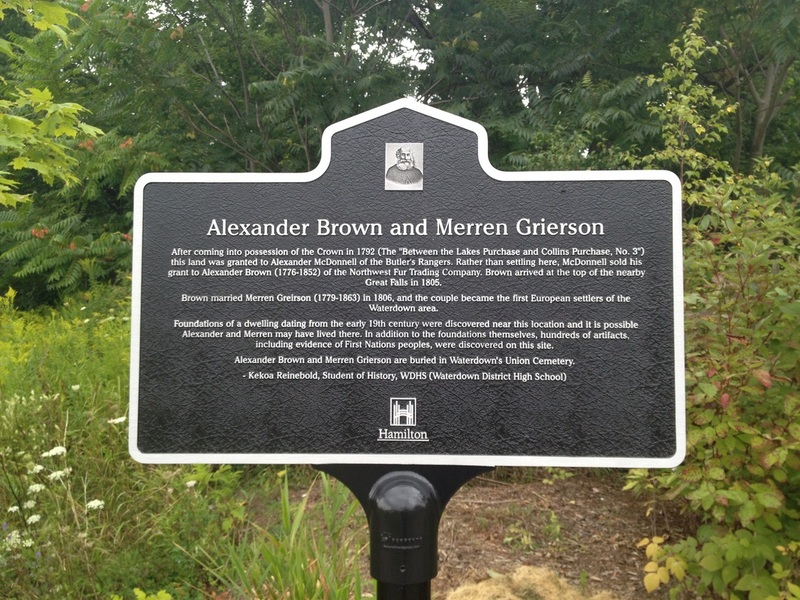 The Natural Area includes a plaque identifying this important landmark, as well as detailing the histories of Merren Grierson and Alexander Brown, that was also unvieled by the Lieutenant Governor and Chief LaForme. Following the dedication ceremony a private reception was held at the Tidridge Residence in Waterdown. Picture of the foundations discovered in the Waterdown Bay Development. Photo taken in 2008. At sunrise on August 21st Elder Garry Sault lit a Sacred Fire - the first such fire in Flamborough in generations (possibly centuries). Rocky Burnham of the Six Nations on the Grand River acted as Fire Keeper. The Souharissen Natural Area Canoe Garden (Wiigwaasi-Jiimaan) was inspired by Carolyn King of the Mississaugas of the New Credit Nation, the host nation of the Toronto 2015 Pan Am/Parapan Am Games. 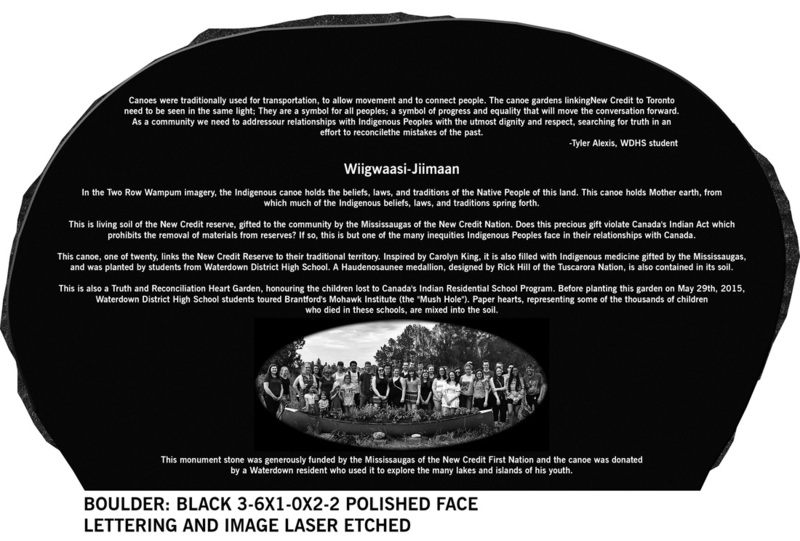 This canoe, one of twenty, links the New Credit Reserve to their traditional territory and is filled with Indigenous medicine presented by September Sault of the Mississaugas of the New Credit and planted by students from Waterdown District High School. On the day that students traveled to New Credit Reserve to receive the plants for the garden, a bag of reserve soil was also presented to Nathan Tidridge -- a violation of the Indian Act, Section 93, (a)(i) -- to mix into the Souharissen Canoe Garden to highlight ongoing violations of the Treaty relationship. The garden is also a Heart Garden, part of a network established by the Truth and Reconciliation Commission (the final report of the TRC was delivered on June 2nd, 2015). A medallion from the Haudenosaunee Confederacy (honouring that this land is also their traditional territory) is also contained in its soil. 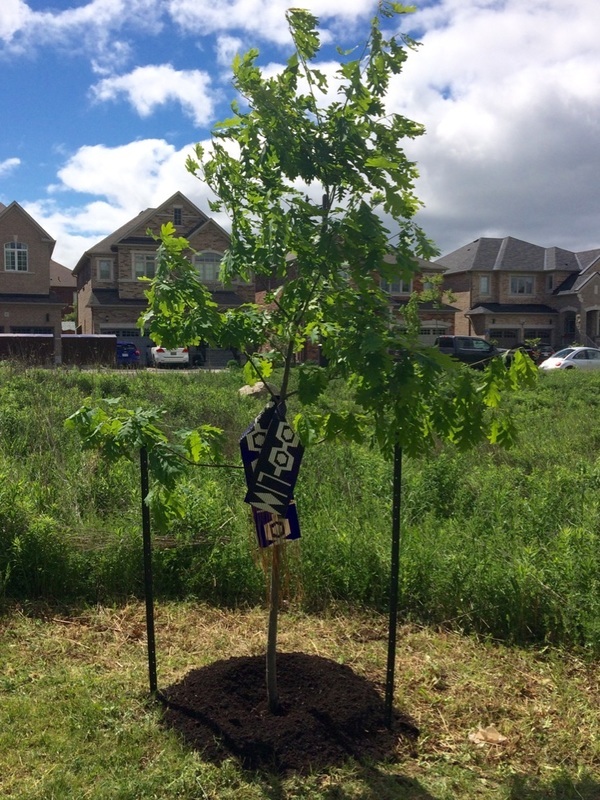 Dedicated by the community, including Councillor Judi Partridge and Trustee Penny Deathe, on May 29th, 2015. 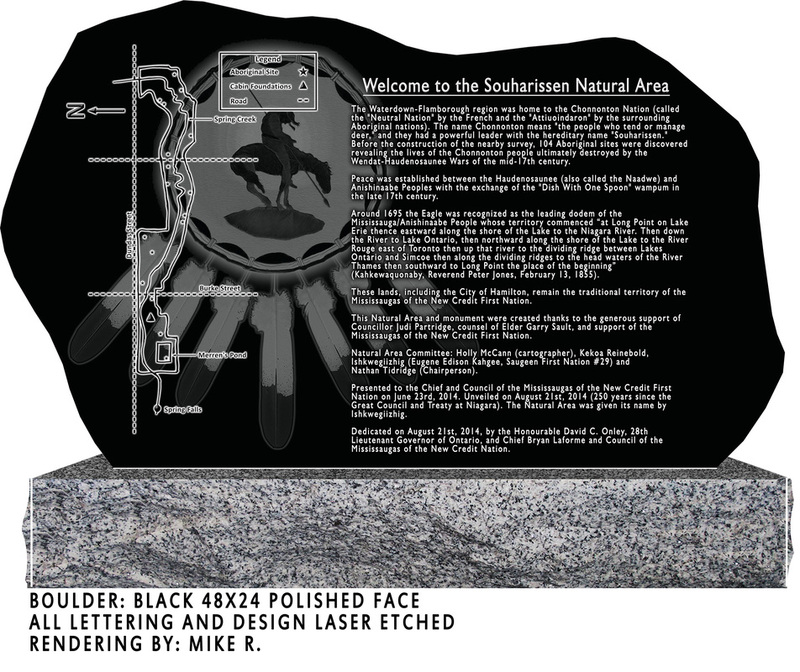 ​of the Mississaugas of the New Credit. Mixed in the roots of this White Oak is a bead from a replica of the Covenant Chain Wampum (one of the wampum exchanged at the Treaty of Niagara in 1764).